Video – Eye Anatomy: The Cornea…and Contact Lenses, Degenerations and Keratoconus | Visionary Eyecare's Blog: "The Eye Journal"
Your eye is like a camera. There are 2 structures that focus light – much like the lens of a camera. These 2 structures are the cornea and the lens. The cornea is the clear front surface of your eye that is located in front of the colored part of your eye (called the iris). If you are a contact lens wearer – the contact lens sits on the cornea. Not all corneas are the same size. Some are more curved or “steep” and others are more “flat”. It is important to be properly fit for contact lenses by your eye doctor. If a contact lens is not properly fit, the contact can cause serious problems for the wearer – including corneal distortion, corneal swelling, corneal ulcers, inflammation and more. A corneal topographer is an instument that can detect any corneal distortions caused from a contact lens. A contact lens may look and feel “fine” but, it can still be causing problems that you may be unaware of. Many times sleeping in your contact lenses or overwearing your contacts (wearing a 2 week contact for more than 2 weeks) can cause corneal distortions. At Visionary Eyecare in Pembroke Pines, Sunrise and Davie- we perform a corneal topography on ALL contact lens patients. During the contact lens eye exam we use the corneal topographer to monitor the health of the patient’s cornea before fitting with a new contact lens and also to monitor the corneal health year to year for established contact lens wearers. Corneal Topography can also detect some corneal degenerations and corneal dystrophies like keratoconus. Typically a person with keratoconus has a lot of astigmatistm, distorted vision and possibly sensitivity to light. 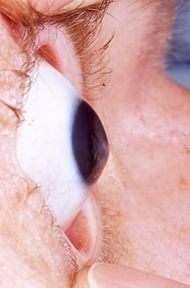 The cornea starts to protrude in a “cone-like” fashion. Most of the time a specialty contact lens can help these patients see clearer and may prevent the corneal dystrophy progression. In advanced cases, the apex of the cornea may thin so drastically from keratoconus that a corneal transplant may be necessary. This entry was posted in Astigmatism, Causes of Blurry Vision, Contact Lenses, Eye Anatomy, Keratoconus, Videos and tagged Astigmatism, Camera Eye, Cone Cornea, Contact Lens, Contact Lens Davie, Contact Lens Eye Exam, Contact Lens Fit, Contact Lens Patient, Contact Lens Pembroke Pines, Contact Lens Sunrise, Contact Lens Wearer, Cornea, Cornea Contact Lens, Cornea Contacts, Cornea Size, Corneal Distortion, Corneal Distortions, Corneal Dystrophy, Corneal Swelling, Corneal Topographer, Corneal Topography, Corneal Transplant, Corneal Ulcer, Distorted Vision, Eye, Eye Camera, Eye Doctor, Eye Doctor Davie, Eye Doctor Pemboke Pines, Eye Doctor Sunrise, Eye Exam Davie, Eye Exam Pembroke Pines, Eye Exam Sunrise, Eye Inflammation, Eye Iris, Eye Lens, Focus Light, Keratoconus, Overwearing Contacts, See Clearer, Sensitivity to Light, Sleeping in Contacts, Sleeping In Your Contact Lenses, Specialty Contact Lens, Video, Video Cornea, Video eye, Visionary Eyecare, Visionary Eyecare - Davie, Visionary Eyecare- Pembroke Pines, Visionary Eyecre Sunrise. Bookmark the permalink. I never know that my eyes is such a miracle, it is indeed like a camera. or perhaps I should say camera work just like my eyes.